The roads are narrow and the mass of fellow humans overwhelming. Jostling one’s way through this intractable crowd is a skill only acquired with repeated visits to the place. I didn’t do badly, considering it was only my second trip. 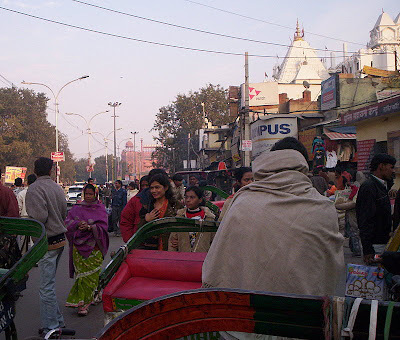 Revisiting the pavement book bazaar in Daryaganj, situated in Old Delhi or the other face of the city I call home, brought back snapshots of a winter morning tucked away in the memory files. Nearly a decade ago, I had visited the place for the first time with a co-worker friend. I had been instantly besotted with Booklane. On that sunny January morning (or was it December? ), my friend had gifted me a trip to this booklover’s promised land. 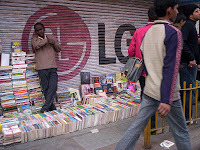 I remember my sense of wonder on seeing this never-ending strip of book stalls, the 200-odd sellers displaying their collections neatly on the pavement and producing your requested book in a jiffy. We spent hours and hours scouring through the books, a lot of them secondhand. One is free to read, not just browse through books in this leisurely atmosphere. The sun had warmed our feet, the books our hands and hearts, the prices our pockets. 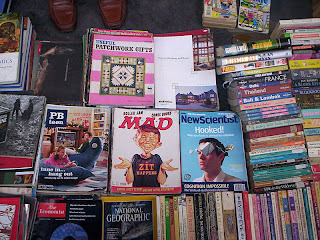 The Sunday book bazaar is popular because of the availability of good, even rare books at cheap prices. The memory has faded a bit, but I do remember returning home with a Seamus Heaney anthology and a book of plays, biographies and other interesting details, put together by the National School of Drama or NSD. Both prized possessions to this day. Without a doubt, that winter’s day happened to be one of the brightest in my life. My visit to Booklane last Sunday wasn’t as merry, though. The area for the book bazaar seemed to have shrunk a bit, and this time, it was really a battle to make one’s way through the crowd. Even when my feet landed at a spot that would let me look at the books, the view was anything but happy. Most of the stalls were packed with textbooks of all sorts. Students thronged the place, picking up fat books at cheap prices. The fiction lover was virtually non-existent. 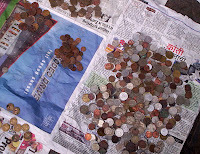 Coin lovers weren’t, though, because this is also a great venue to buy old coins dating back to the era of the British Raj.Although the trip to Booklane wasn’t all that satisfying, the jaunt to Old Delhi was immensely fulfilling. For here is a world sheltering a culture and a history that has almost ebbed out of the modern city life I witness every day. And amid all the crowd and congestion lies a charm that keeps calling you to the place again and again. Yes, more trips planned to the walled city. Special thanks to Bhupinder for making me Booklane bound. “Besotted”The exact word – and the exact way I feel anywhere near booksellers! Hi,I wrote this poem inspired by your post on Old Delhi Booklane-In that long and straight booklaneMany Sundays have been spentWalking, picking, walking The pearls and diamondsThose lie scattered on the pavementsAmidst the heat, dust and sweatEvery time one returns enrichedWith the precious treasures For a few paisa and rupeesThe booklovers of the worldYou must go if you have not already beenTo the old Delhi booklaneTo the city ancientTo the city of yoreTo see the vignettes of the past; andTo gather the priceless treasuresThose remain hidden in its heart!Many thanks for inspiring!Cheers! Sounds like fun – even if you didn’t find a lot of fiction…Just popped by to say hello and wish you a Happy New Year! Such beautiful description. I’m sorry your second visit wasn’t as pleasing as the first. I’d love to have something like that to go to! Its been years since I have been there, your post made me take a nostalgic, even if virtual trip!Thanks too for the pictures.>The fiction lover was virtually non-existent.That’s a pity, last time I was there, one of my most treasured finds was an aging copy of ‘Arts and Ideas’ that Alok Bhalla used to bring out, the theme of this particular one was the fictions of Garcia Marquez. You always have the best posts. This reminds me of the library book sales I go to, and the fela markets I have gone to. Too bad about the textbooks though. Just found your blog, such good stuff to read. 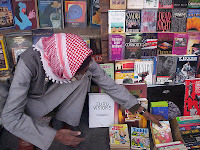 I loved your pictures of the book market, how I would love to stroll through. The atmosphere must be incredible. So much nicer than a store with the dreadful “Piped in music”.Going to stay here a while longer and read some more of your posts.Sylvia. i can almost smell the books in this post-DBB indeed used to be a bibliophile’s haven.I remember spending many a joyous sunday here ,having once bought POWER AND GLORY for a tenner!I remember chiding the bookseller for selling the classic so cheap. Thanks for reading and sharing your own memories of the book bazaar, Santosh! For students who couldn’t afford books from conventional bookshops, this street market really was a heaven.